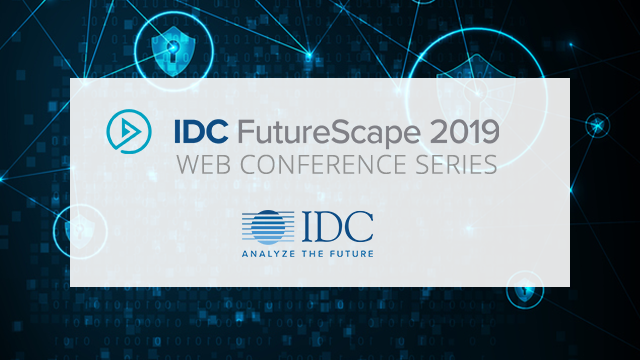 In this IDC FutureScape presentation, IDC's Sean Pike will lead a team discussion of the key predictions that will impact enterprise security purchase decisions over the next one to five years. Senior IT leaders and line-of-business executives will come away with guidance for managing the implications these predictions harbor for their IT investment priorities and implementation strategies. Join IDC's Worldwide Channels and Alliances team as they discuss the trends they are seeing in software and infrastructure channels as well as in strategic alliances. The team will also review their 2018 predictions (and outcomes) and present their predictions for 2019 and beyond. Cloud is the foundation for digital transformation. European organisations are adopting multicloud strategies to accelerate digital transformation initiatives and innovation. While the European cloud market is increasingly dominated by the global hyperscalers, European organisations are deploying a broad range of cloud services ranging from private cloud, hosted private cloud to public cloud in a multicloud architecture, to cater for data protection and regulatory compliance requirements as well as industry specific needs. This multicloud platform is the launchpad for multiplied innovation. In this webinar, we will look at how organisations will embrace cloud-native applications, cloud-based AI solutions as well as cloud-to-edge architectures. Western European enterprises are set to invest $1.3 trillion into Digital Transformation from 2018 to 2022. Resting on hyperscale and multi-cloud platforms, these DX initiatives are fundamentally altering how enterprises operate and generate value. European enterprises are rearchitecting their systems, revising metrics used to assess success, rethinking how they relate to customers, and finding new ways for people to work. Join our DX predictions webinar to better understand the impact of DX on European enterprises as they move forward. In this IDC FutureScape presentation, IDC's Tom Mainelli will lead a team discussion of the key predictions that will impact the consumer devices and augmented reality and virtual reality (AR/VR) markets over the next one to five years. Senior IT leaders and line-of-business executives will come away with guidance for managing the implications these predictions harbor for their IT investment priorities and implementation strategies. In this IDC FutureScape presentation, IDC's Dan Vesset and David Schubmehl will discuss the key predictions that will impact the business analytics and cognitive software markets over the next three to five years. Senior IT leaders and line-of-business executives will come away with guidance for managing the implications these predictions harbor for their IT investment priorities and implementation strategies. In this IDC FutureScape presentation, the IDC Worldwide Financial Insights team discusses the key predictions that will impact CIOs and IT professionals in the worldwide financial services industry over the one three to five years. Senior IT leaders and line-of-business executives will come away with guidance for managing the implications these predictions harbor for their IT investment priorities and implementation strategies. In this IDC FutureScape presentation, the IDC Worldwide Oil & Gas team discusses the key predictions that will impact CIOs and IT professionals in the worldwide oil & gas industry over the next one to five years. Senior IT leaders and line-of-business executives will come away with guidance for managing the implications these predictions harbor for their IT investment priorities and implementation strategies. In this IDC FutureScape presentation, the IDC Worldwide Smart Cities team discusses the key predictions that will impact CIOs and IT professionals in the worldwide smart cities industry over the one three to five years. Senior IT leaders and line-of-business executives will come away with guidance for managing the implications these predictions harbor for their IT investment priorities and implementation strategies. Watch Thomas Meyer and Phil Carter present IDC's technology predictions for 2019 and beyond. In this IDC FutureScape presentation, analysts discuss key predictions that will impact CIOs and IT professionals in the future of work over the next one to five years. In this IDC FutureScape presentation, the IDC Worldwide Retail team discusses the key predictions that will impact CIOs and IT professionals in the worldwide retail industry over the next one to five years. Senior IT leaders and line-of-business executives will come away with guidance for managing the implications these predictions harbor for their IT investment priorities and implementation strategies. In this IDC FutureScape presentation, IDC's Alan Webber will discuss the key predictions that will impact how enterprises address the customer experience over the next one to five years. Senior IT leaders and line-of-business executives will come away with guidance for managing the implications these predictions harbor for their IT investment priorities and implementation strategies. IDC FutureScape reports are used to shape enterprise IT strategy and planning by providing a basic framework for evaluating IT initiatives in terms of their value to business strategy now and in the foreseeable future. IDC's FutureScapes are comprised of a set of predictions designed to identify a range of pending issues that CIOs and senior technology professionals will confront within the typical three-year business planning cycle. Each prediction is assessed on the basis of its complexity, organizational impact, and time frame to expected mainstream adoption. In this IDC FutureScape presentation, IDC's Matt Arcaro and Jeff Hojlo will discuss the key predictions that will impact the connected vehicles ecosystem over the next one to five years. Senior IT leaders and line-of-business executives will come away with guidance for managing the implications these predictions harbor for their IT investment priorities and implementation strategies. In this IDC FutureScape presentation, the IDC Worldwide Utilities team discusses the key predictions that will impact CIOs and IT professionals in the worldwide utilities industry over the next one to five years. Senior IT leaders and line-of-business executives will come away with guidance for managing the implications these predictions harbor for their IT investment priorities and implementation strategies. In this IDC FutureScape presentation, IDC's Keith Kmetz, Tim Greene, and Mun Chun Lim will discuss several of the key predictions that will impact the 3D printing market over the next one to five years. Senior IT leaders and line-of-business executives will come away with guidance for managing the implications these predictions harbor for their IT investment priorities and implementation strategies. In this IDC FutureScape presentation, the IDC Worldwide Robotics team discusses the key predictions that will impact CIOs and IT professionals in the worldwide robotics industry over the next one to five years. Senior IT leaders and line-of-business executives will come away with guidance for managing the implications these predictions harbor for their IT investment priorities and implementation strategies. In this IDC FutureScape presentation, IDC's Frank Della Rosa, Larry Carvalho, and Deepak Mohan will discuss some of the key predictions that will impact the global market for cloud services over the next one to five years. Senior IT leaders and line-of-business executives will come away with guidance for managing the implications these predictions harbor for their IT investment priorities and implementation strategies. In this IDC FutureScape presentation, the IDC Worldwide Manufacturing team discusses the key predictions that will impact CIOs and IT professionals in the worldwide manufacturing industry over the next one to five years. Senior IT leaders and line-of-business executives will come away with guidance for managing the implications these predictions harbor for their IT investment priorities and implementation strategies. In this IDC FutureScape presentation, the IDC Worldwide Healthcare team discusses the key predictions that will impact CIOs and IT professionals in the worldwide healthcare industry over the next one to five years. Senior IT leaders and line-of-business executives will come away with guidance for managing the implications these predictions harbor for their IT investment priorities and implementation strategies.